FUE hair transplant is the latest / new technique of hair transplant. In this technique of hair transplant instead of a strip of skin individual hair follicles or group of 2-4 follicles (follicular units) are extracted from the donor area of scalp. The area of our body from where hairs can be extracted for hair transplant over the bald areas of body is called the donor area. FUE technique has the advantage that by this technique hairs for hair transplant can be extracted from almost every part of body. If we are using FUE hair transplant technique then the donor areas can be: scalp, beard, chest, abdomen, back, armpit, pubic region, legs and upper limb. If we are using FUT / strip technique for hair transplant then the donor area is only scalp. FUT technique cannot be used to extract hair from any other part of body. More hairs than all other donor areas. Around 7000-8000 grafts can be harvested from the scalp. Quality of hair over the scalp are far better than the rest of the areas of body. Scalp hairs are thick and can grow to any length. The hairs at other areas of body are thin and growth is slow with length limited except the beard area. hairs from scalp have a longer life as compared to hairs from other areas of body. One of the Ten Commandments of Plastic Surgery given by Sir Harold Gilles (Father of Modern Plastic Surgery) is ” LIKE REPLACES LIKE “. This means that its best to replace a lost body part by tissue from the same body part. By this principle the lost scalp hairs are to be replaced by hairs from scalp only. There is a specific area over the back of your scalp, that bears the hair follicle which are resistant to shedding. The hair of this area do not shed even in the most extreme of the conditions. Even under severe nutritional deficiency this area hair follicle are not shed. Even DHT cannot harm the root of hair follicle of this region. The hair of this area are the last hair to fall from our scalp. Even they are resistant to ageing and are even present when the person reaches the age of 80s & 90s. During hair transplant it is preferable but not mandatory to harvest hair follicles from this area of scalp. During FUE hair transplant the safe zone is market over the scalp and hair follicles are primarily extracted from this area of scalp. As already described FUE hair transplant technique is the latest technique of hair transplant. This technique was developed to overcome the major limitations and drawbacks of FUT hair transplant. In FUE technique fine punches are used to extract hair follicles from the donor area. These hair transplant punches are cylindrical device with sharp tips. The punch used for this is similar to skin biopsy punch and comes in various sizes from 1.0 mms to 0.6 mms. These punches are used to drill a circular hole around the hairs. The punch is inserted into the donor area encircling the hair follicle unit to be extracted. 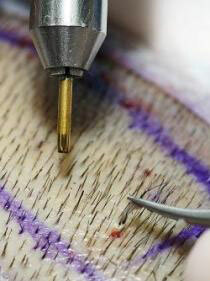 Motorised devices are used to propel these punches into the skin for harvesting the hair follicles. The punch is pushed inside with rotating movement and to a depth sufficient enough to release major attachments of the hair follicle with the scalp skin. This separates the attachments of the hair follicle with the surrounding skin tissues. After their attachments get removed these hair follicles can be easily taken out from the scalp. In FUE hair transplant the punched-out hair follicles are then manually extracted with forceps or with the motorised suction device which employs no touch technique for hair follicle extraction. 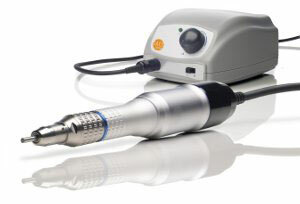 As hair follicles in FUE technique are to be harvested from the back of the scalp, the patient is to lie down over the operation/derma table. You have to lie down in prone position i.e. on your stomach. The exact area from which grafts need to be extracted is marked over the safe zone. The hairs over the marked area are trimmed using Philips trimmer. The procedure room / operation theatre is fumigated beforehand. Preparation of the donor area is done with betadine solution and draping is done keeping all asceptic precautions. Local anaesthetic solution is then injected. At Hair transplant in delhi the donor area is injected superficially first, followed by a slightly deep injection along the entire hairline to create a field anaesthesia. Approximately 25 mL of 1:50,000 adrenaline solution is injected into the donor region for tumescence. All the equipments are checked for appropriate functioning and the RMP of the motor is set at predefined level. Under magnification and special lighting the direction of the hair follicles inside the skin of scalp is visualised and the hair transplant surgeon then angles the punch accordingly. The micro motor then rotates the punch and the punch is then inserted in the skin. The punch is pushed inside with rotating movement and to a depth sufficient enough to release major attachments of the hair follicle with the scalp skin. This separates the attachments of the hair follicle with the surrounding skin tissues. In FUE hair transplant the punched-out hair follicles are then manually extracted with forceps or with the motorised suction device which employs no touch technique for hair follicle extraction. In this manner the required number of hair follicles / grafts are harvested from the donor area by repeating this process all over the donor area. Care is taken that only 2-3 hair follicles are removed from each group of hair follicles over the donor area. We need not take out all the hair follicles from one pack of hair follicles. Also care is taken to extract hair follicles after leaving proper gap between the two extractions. After completion of extraction of required number of hair follicles the donor area is cleaned and dressed with sterile dressings. No limitation of donor area: FUE hair transplant technique has unique advantage that this technique can be used to extract hair follicles from any part of body. FUT hair transplant technique can only be used to extract hair follicles from scalp only. Unlimited grafts: as the donor area is not limited to scalp, there is unlimited supply of grafts in FUE hair transplant technique. Thousands of grafts can be harvested from all over the body. Even grade VII baldness patient can get satisfactory results by this technique. Better graft survival: in FUE hair transplant the outside body time for hair folicles is less hence more grafts survive. This improves the result of FUE hair transplant when compared with FUT technique. No Pain: FUE hair transplant is not a surgical procedure as no scalpel / knife is used and skin is not cut. It is done as an OPD procedure and there is no need to admit the patient. No Infection: as we stay superficial there is no penetration of the deeper portion of skin. This results in less chances of infection in FUE hair transplant. No Bleeding: as we stay very superficial in FUE hair transplant, there is absolutely no chance to damage any underlying blood vessel. No sensory loss: as FUE hair transplant is done in the superficial layer of scalp there is no risk of nerve injury and sensory loss. Early recovery: since FUE hair transplant is done in the superficial layer of skin, the healing is faster. You can return to your work in a day or two. No Scarring: Unlike FUT there is no ugly scar after FUE technique. The reason is that the skin is not cut in FUE hair transplant, so there will be no scar. Hair follicles are removed through tiny superficial holes in the scalp. Being superficial they heal very fast hardly leaving any scar. Even if there is some scar, it is spread over a large area and hence its not visible. There is no hyperophic scarring, keloid formation or cancer formtion. FUE hair transplant is more time consuming for both the patient and the physician. In FUE hair transplant technique a larger donor area is needed for extraction of hair follicles. FUE hair transplant technique also renders the scalp donor area unfit for further hair follicle extraction using the strip technique. At Hair transplant in delhi after harvesting the grafts, the hair follicles units are prepared for hair transplant under microscopic visualization. Dissection under magnification is specially important to prevent hair follicle transection and identification of hair follicles for implantation to different bald areas of scalp. In FUE hair transplant hair follicles are separated into clusters of 1-4 hairs and are then implanted to the bald areas of scalp. At Hair transplant in delhi on an average a single naturally occurring hair follicle unit or graft contains about 2.3 hair follicles. The final separated hair follicle at FUE Hair transplant in delhi, ready for transplantation should have a pear shape where in the epidermis has been maximally trimmed and the dermal and subcutaneous tissue surrounding the hair follicle isthmus and bulb remains intact. Selection of proper storage solution has grown increasingly more important as “mega-session” FUE hair transplant involving slimmer grafts have become more common and out-of-body time has increased. Survival of transplanted grafts has been shown to decrease by about 10% per hour out of the body time. FUE Hair transplant the factors which reduce the graft survival during this extended out-of-body time include ischemia-induced hypoxemia and subsequent adenosine triphosphate depletion, as well as ischemia-reperfusion injury. Three types of storage media (intravenous fluids, culture media and hypothermic tissue–holding solutions) help minimise out-of-body variations in pH, osmotic balance, antioxidant capabilities, and nutrient support to the hair follicle. Minimise Out of Body Time: The bald area that is to be implanted with new hairs needs to be prepared for hair transplant. Now one critical thing to understand here is that. The hair transplant Surgeon need to reduce the “Out of Body Time” of hair follicles. This means that during hair transplant the surgeon must implant the hair follicles as soon as possible to the donor or bald areas. Natural Direction of Hair: The critical element with donor area preparation is the angle and direction at which the hair follicles will leave the scalp. The slits during hair transplant are to be made in direction which is natural for that area of the scalp. This gives natural results of hair transplant. The angle and direction of each area of scalp is different then the other area. The difference is not an abrupt one but a slow and continuous process all along the scalp. The adjoining hairs are slightly different in angle then the adjoining hair. Hair Density: The most widely accepted hair density of hair follicle insertion at the recipient site is 100-120 hair follicle units per square centimeter. Some of the practitioners in delhi advocate for a denser packing of hairs, more than 200 hair follicle units per square centimeter. FUE Hair transplant in delhi says this can however compromise the viability of the grafts as the competition between the transplanted hair follicles for a limited blood supply increases. This much denser packing means more number of slits per centimeter square. This can compromise the blood supply of the region of scalp. This can lead to necrosis of the scalp and the hair transplant area becomes dead. Various techniques are used for recipient site creation and graft insertion. 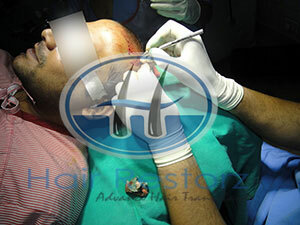 Blades are cut at hair transplant in delhi to match the size of the hair follicule units to be inserted. At Some FUE Hair transplant centers hair transplant in delhi surgeons use hypodermic needles to make incisions for hair follicle placement. FUE Hair transplant recipient site size increases as the surgeon moves posterior away from the hairline and the priority shifts from single, fine hairs to multiple, coarser hair follicule units. At Hair transplant in delhi a “stick-and-place” technique can be used to eliminate the time between which the recipient site is prepared and the hair follicle graft is placed within it. The “spread-and-place” Fue hair transplant technique at hair transplant in delhi reduces the mechanical trauma from hair follicle graft handling as the hair follicle is placed into a smaller recipient site. At Hair transplant in delhi, for insertion of hair follicle imported forceps from Germany are used to gently place the grafts into the recipient sites. Transplanted hair follicle viability is maximized by minimizing the mechanical trauma to the hair follicle during its insertion. At hair transplant in delhi this is accomplished by handling the dead portion of the hair (the part of hair which lies outside the scalp) rather than the sub-epidermal portion of the hair follicle itself. At Hair transplant in delhi, hair implantation devices allow for near-simultaneous recipient site creation and hair follicle insertion.